Our distributor AgriPan organized a few days of demo of the 14 to the 17 of November in the area of the Peloponnese in Greece. We show you images of those days. The meeting was divided into 4 days to visit several areas. In each one of the shows there was a great participation and expectation by check the performance of our harvesting equipment in their crops. The demo of the Agromelca harvesting equipments began the 14th November in the areas of the Agrinio and Messolonghi. In Agrinio was collected a green olives of the variety Koroneiki, and, in the Messolonghi, was collected olives Koroneiki and Kalamon. 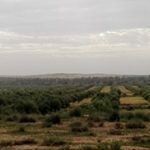 The next day, The demo of harvesting of olives was carried out in the area of Lakonia, in an area calls Skala, again in the varieties of Koroneiki and Kalamon. The third day of demonstrations was held in the area of Pylos, in Messina, in different plantations with the olives variety Koroneiki. Since Agromelca we thanks to AgriPan, S.A. by the good organization of these days, as well as the participation of all stakeholders.